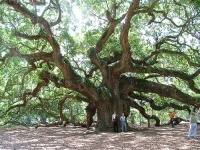 Angel Oak is thought to be the oldest existing entity east of the Rocky Mountains. This extraordinary live oak is over 1,400 years old and boasts a vast canopy in excess of 17,000 square feet, despite it not being very tall. Also known as Scarlet's Tree, it's survived countless hurricanes, floods, and earthquakes, including severe damage from Hurricane Hugo in 1989. The tree's forest home may have been one of the islands' many lumber sources for ship-building back in the 18th century, yet nowadays the park and tree are owned by the city of Charleston. The Angel Tree features in various local legends and books. Keeping the tree safe from encroaching urban development has lately become an issue, although so far it is still located deep enough in the forest to be safe.